Summary: These figures were somewhat better than I had expected. The regulated-tenancy property trader produced a record level of revenue during the second half to counterbalance a rather disappointing first half, and the end result was not far off the very strong numbers delivered for the previous year. I was also pleased net asset value advanced further to a new high while borrowings were reduced to a fresh low. My updated sums now point to a possible NAV of £206 per share based on the firm’s previous gains on sold properties. I continue to hold. MTVW described these results as “very sound” and they were better than I had expected. 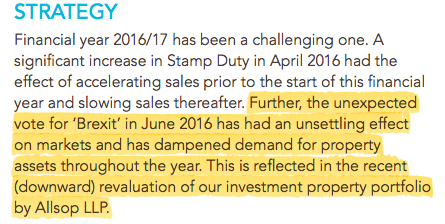 As you might recall, MTVW’s interims issued last November were somewhat disappointing following increases to the rate of stamp duty. Back then, MTVW reported first half-revenue and operating profit down 21% and 16% respectively. 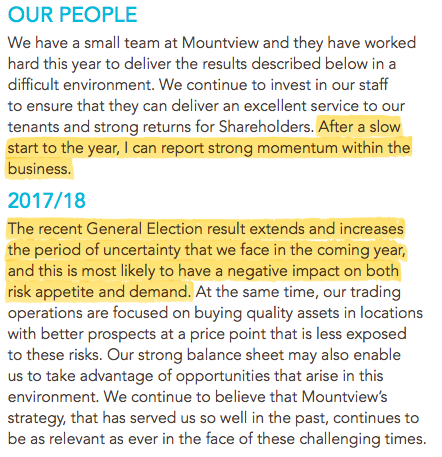 MTVW’s RNS results narrative was not as terse as usual — this year the chief exec’s statement ran to four paragraphs. There should be much more detail about MTVW’s 2017 progress within the forthcoming annual report. H2 revenue of £44m is a new six-month record while the accompanying H2 £28m gross profit almost equals the freak result of H1 2016. 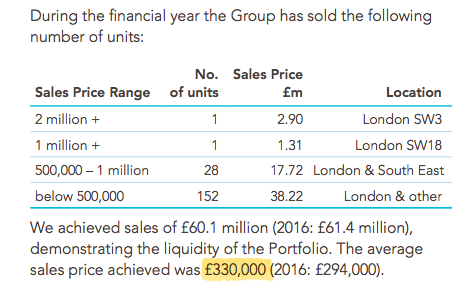 A 66.5% gross margin is equivalent to MTVW selling a property for a 199% gain. For some perspective, the group has enjoyed an average 166% gain during the prior ten years. Although MTVW’s full-year profit was not the highest the firm has ever recorded, it did add £24m to the balance sheet to help take net asset value (NAV) to a fresh £336m/£86 per share peak. Something worth noting is that MTVW’s total borrowings decreased by £10m to £32m during the year — and they now stand at their lowest level since 2007. Looking back, 2007 was a good time for property companies to be light on debt. In fact, I speculated in November that MTVW’s low debts could be due to its veteran chief exec — who has been in charge since 1990 — sensing that now may not be the best time to be going all out buying stock. That being said… my rough sums indicate MTVW pumped a significant £22m into fresh stock during H2 versus about £12m for H1 and £13m for H2 of 2016. So perhaps we aren’t due a major housing downturn after all. Indeed, I wonder if MTVW is now able to pick up some bargains as other landlords shy away from property because of the higher levels of stamp duty. You can see net debt falling considerably and, representing the equivalent of 9% of the firm’s trading properties, is at its lowest relative level for at least 20 years. In the past, this ratio has often topped 30% and suggests MTVW could have the current capacity to borrow another £60m. Two minor points from these results surprised me. First the dividend — it was held at 300p per share. Given profit for the full year was down only 2% and borrowings are historically low, I did think a small lift to the payout could have been justified. Second, MTVW’s standard investment properties — a group of homes located in Belsize Park, London — lost £1m of their collective fair value during the year. It’s unusual for this particular collection of properties to lose any value. Their aggregate valuation has declined only once before — during 2009 — since MTVW acquired them in 1999. The Belsize Park portfolio is now in the books at £29m. These results revealed trading properties with a £337m book value, which could yield £924m if they were all sold at the average margin enjoyed during the last ten years. 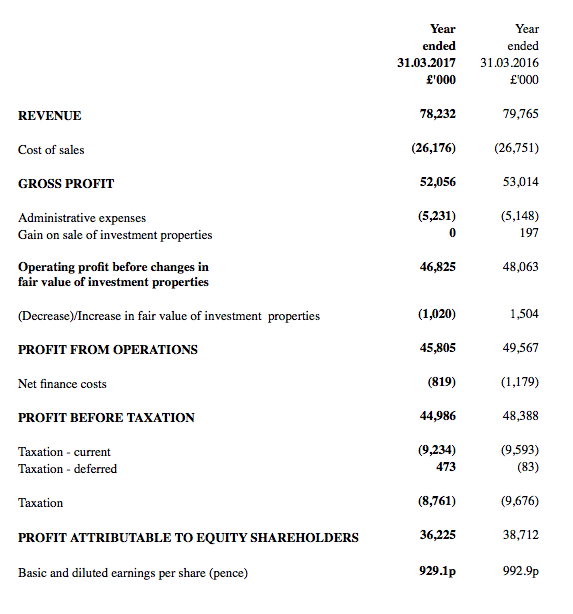 Taxing the resultant gain at 19% and then adding on the Belsize Park investments of £29m and then subtracting net debt of £31m and other liabilities of £9m, I arrive at a possible net asset value (NAV) of £803m or £206 a share. That compares to the £86 per share NAV reported by MTVW on its usual historical-cost basis. With the share price at £110, clearly there remains some upside potential here. But as always, the great unknown is how long it will take MTVW to sell all of its properties to realise that potential £206 per share NAV guess. For a more immediate valuation, there is the £666m figure assigned to MTVW’s trading stock by an independent assessment as at September 2014. This £666m valuation is becoming a little stale now, but for what it is worth, adjusting this valuation for tax, the investment properties and debt gives an NAV of £151 a share. As a reminder, this £151 estimate is based on MTVW’s properties being in their current ‘regulated tenancy’ state — so does not include any upside potential for when the property is vacated and can be sold at market value. And as before, this £151 estimate does not include any house-price gains experienced since the September 2014 assessment, and nor does it adjust for any properties bought or sold thereafter. Meanwhile, the maintained 300p per share dividend provides a yield of 2.7% at £110. The terse chief exec’s narrative within the results RNS was expanded upon slightly within the annual report by the chairman. For context, the average sale price agreed during 2009 — the first year MTVW disclosed the figure — was £161k. It has advanced every year since. Average price paid was £255k. Not surprisingly, the consultants determined their clients were underpaid. The chief exec received a nice 32% wage hike, to £500k. 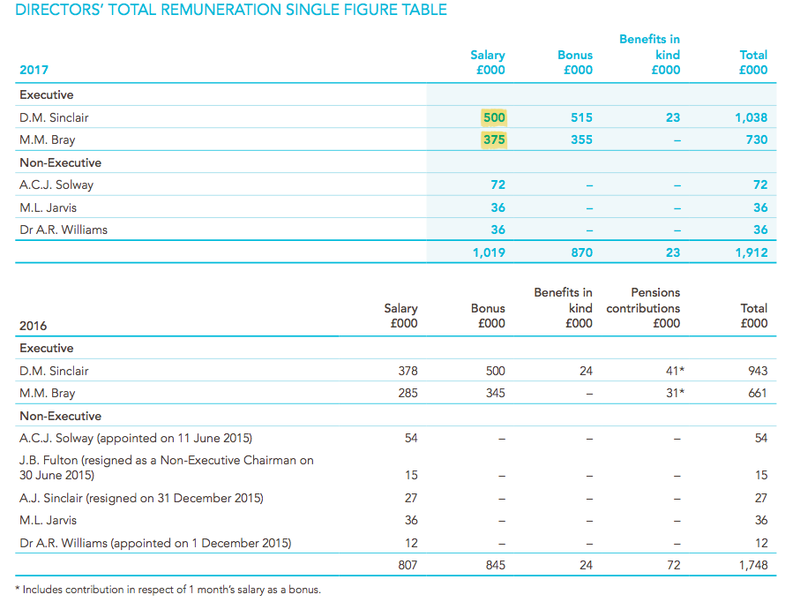 To be fair, the chief exec’s pay has compounded at the same c13% rate as the dividend during the last 5 years. I would not say the chief exec is underpaid with a £1m take-home pot last year, but it’s hard to argue with the group’s track record since he took charge during 1990. The average cost of the 27 employees (including directors) stayed at (a lofty) £139k. It seems to me some properties currently carried as stock and valued at cost could in time be designated investment properties by IAS40 and therefore carried at market value. The change could provide extra evidence of how undervalued some of MTVW’s properties are — although the numbers of properties potentially involved is not known. Last year the prediction was £20.5m and in the event stock of £20.3m was sold. So the note suggests the financial performance during 2018 could be similar to that of 2017, which I can accept. I would like to think another Allsop valuation could occur during 2019, five years after the initial 2014 exercise. 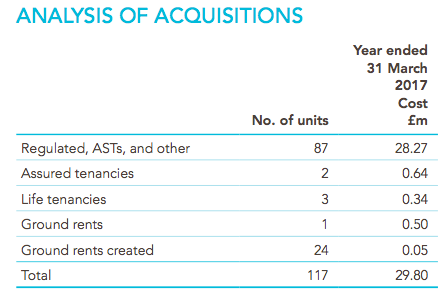 Note that the Allsop valuations of 2014 were 2.1x greater than the then book value of the properties. Based on the small sample of properties sold during 2017, it appears today’s market values are 2.1 x 1.48 = 3.1x the value stated in the books. My very rough sums suggest MTVW’s book value could be £212 per share based on this 3.1x multiplier (the sums are complicated and adjust for properties sold and bought since September 2014, the group’s investment properties, debt and tax). The facilities are due to be rolled over during the next few years and I hope the cost of borrowing can remain low. It appears the appointment of pay consultants and the subsequent advances to the executives’ pay (see point 3 in my Comment above) has not gone down well with certain shareholders. Shareholders owning an aggregate c828k shares — representing 33% of the total votes cast and 21% of the total share count — voted against the approval of the Remuneration Report and Remuneration Policy (resolutions 4 and 5). A similar proportion voted against the re-appointment of the current auditors (resolution 6). Plus, resolution 8 — the reappointment of one of the non-execs — was not passed by shareholders. Voting for this resolution was limited to shareholders outside of the Sinclair concert party. Those three holdings come to 875k shares, so about 48k more than the 828k that voted against the resolutions. I would guess that the Murphys plus certain others are behind the dissident voting. When I attended MTVW’s AGM back in 2014, Mr G Murphy (husband of 15% shareholder Mrs MA Murphy, who in turn is the sister of MTVW’s chief exec) was a vocal critic of the board.